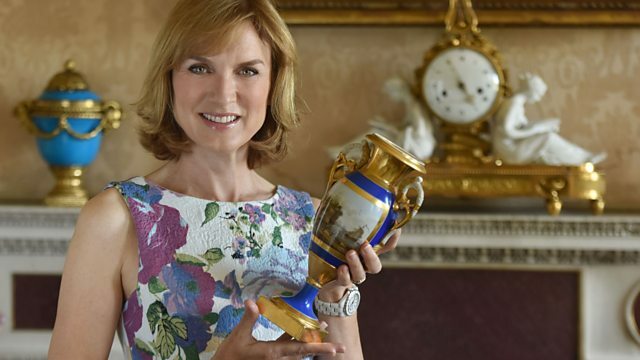 Fiona Bruce and the team return to Hanbury Hall in Worcestershire. Items include an enormous fishing rod, a narwhal tusk, a piece of trench art and shiny buttons. Browse content similar to Hanbury Hall 2. Check below for episodes and series from the same categories and more! home to successive generations of the Vernon family. Today, it's looked after by the National Trust. but not everything is it seems, both outside and within. who made his considerable fortune as a lawyer. And he spared no expense when it came to designers and craftsmen. wall paintings all up the grand staircase and on the ceiling. It really is art on an epic scale. successive generations did a very good job of spending it all. to settle hefty bills and pay rising taxes. And this is just one of many of the sale catalogues. but an interpretation of how the house would have looked. This wallpaper was bought as recently as the 1980s. These gardens aren't what they seem either. in the style of Capability Brown. The gardens were finally restored as late as the 1990s. as they welcome our visitors. This is a lovely object. Tell me what it is. I haven't the faintest idea what that is! It currently sits on a shelf next to a lava lamp, if that's any help. OK, well, it's not a lava lamp, so that limits the ideas. obviously...you live up here now in the, sort of, Birmingham area. Where did you live when you got that? it's got a title to it, which is a Sussex something. and some of these were made in Tunbridge Wells. Shall I tell you what it is? -Did you live in Tunbridge Wells? No, no, no. I worked in Sussex for a long time. -No, we lived in Sevenoaks. This is a Sussex spice tower. which were all on these little labels here, have worn off. It would have said, cloves, mace, cinnamon, whatever. ..it's a fabulous, sort of, almost like a construction toy. It's a beautiful piece of woodcraft. probably dating from the early part of the 19th century, so 1820, 1830. -It's getting better and better. It is getting better and better. Amazing. How much is the lava lamp worth? Well, I think we bought the lava lamp for 9.99. -OK, so, it's worth a bit more than a lava lamp. I would put it at around 200 to £300. I wonder, do you think it actually even still smells of spice? -Oh, it does smell of spice. if you don't know what it is, take the lid off and smell it. And that'll give you a clue. So, what have we got here, then? that I inherited from my godfather this year. -this piece of paper was inside it. -and a valuation of 1,400 quid. It's not a tantalus. A tantalus is a lockable device. and every time he went to drink the water, the waters pulled back. So water, water everywhere, but not a drop to drink. -to keep the servants' thieving mitts off your booze. So, this is a decanter case. You've correctly described it. And the date? 1850, I'm sure that's about right. at the Great Exhibition in 1851. And I'm going to focus on the metal, funnily enough. If you look at the casting of that, it is absolutely gorgeous. Er, the gilding on the decanters is super. -..it's in really perfect condition. And there lies the problem, you see. Why is it in such good nick? Because nobody ever used it! -Cos nobody ever used it. ..if this was in your house, ladies and gentlemen, would you use this? Would you use this at all? What would you do with it? I'm not seven years old! I'm five years old! I do beg your pardon! exactly what it was worth 23 years ago. It has not moved at all. that we're seeing here, it just doesn't fit into modern lives. which is the reason that relative to its quality, it's dirt cheap. Yeah. Well, it's still beautiful. when it's a library like this, we'll make an exception. It looks like a glazed bookcase, but it's tiny. and it's full of tiny, miniature books. And what sort of books have we got? Oh... Well, that's a fairy story, I think, isn't it? -Yes, Cinderella and Other Fairy Tales. Very nice fairy tale book. What about this one? The Thumb Confession Book. I've missed that one out. But how lovely. Tiny little books that fit in the palm of the hand. Tiny little books for a 13-year-old girl. -Who are we talking about? and these books were given to her for Christmas in 1914, as it says. So, you knew about them as a much younger girl. She bought the... We have the receipt in here. And why did she buy them? What attracted her to this little library? The Selfridges and my grandparents were great friends. They had the shops next door to each other in Oxford Street. and thought, "I'd rather like it." -I can completely understand that. It's wonderful in many, many ways. the world of the book collecting. -although I would say they're not fantastically rare as books. "Well, that's very nice, but probably not terribly valuable." and they're in this gorgeous bookcase, and the Selfridges. I mean, everyone knows the Selfridges all over the world. ..you'd really want it, wouldn't you? Yeah, I suppose you probably would. Well, I think it's lovely. -It's seen some life, unfortunately, hasn't it? Probably! As a child, I probably was. Yes, exactly. I did use them. You know, I really enjoyed it. And, in a way, all of that is as nothing. I think I would stick my neck out and say probably 1,500 to £2,000. Good. Thank you very much. I'm not going to sell it. that's got our experts rather foxed. When I look at these, I think of... the spirit of the 1920s. They are quite theatrical, I think. It has a really great action, look, if we operate it. depending on how fast and how hard you pull it. What about if I added this? -..by Joseph Lorenzl, but, as a group, worth £2,000. What if I added this? So, I think this one is going to be more or less £2-300. -Great little things. Thank you. Maybe the final piece tells you all you need to know? -Something to do with the church? Well, the truth is... we don't really know. I've shown it to almost all of our experts here. Hilary Kay thought maybe sewing accessories. And Eric Knowles said it was a TOP. that you've actually made quite a journey to get here today. from the West Coast of Ireland to come here. I'm a huge fan of the show. I've been watching it for donkey's years. My children do not come near me on Sunday night. Yeah, so, we've been travelling since yesterday to get here. And why this year particularly? Well, it's my 60th birthday this year. I don't believe you for one moment! -I've never seen such a young 60-year-old. She does not look 60.
but I don't really know much about it. -Oh, really? I didn't know it was that old. Yeah. and this is what's called Roman mosaic. but it was made in Rome. This is quite brash. It's quite colourful. Yeah, particularly the wings of the top insect there. -because, during this period, the Victorians loved bugs. -Well, they are like a jewel themselves. was, again, sort of, you know, they were inspired by that. -It's in silver-gilt, so it's not gold. And in fact, you're going to wear this, I hope? I intend to, yeah, I do. it is sort of made for the tourist industry. -But then, that's not what it's about, is it? I think that's just a fabulous journey! to actually hear what it's about, so thank you so much. -it might get £3-500, but it's not about that. It's about the journey of the jewel and its continued journey with you. You like? You don't like? -OK, how long have you liked it for? I've liked it ever since I've known it. and I've absolutely loved it cos I love the feel of it. You know, it's just beautiful. The colour is right and the feel is lovely. I've no idea what it is, but I love it. Nobody liked this stuff. It was just dismissed. and blow me, they were marked on the bottom. I know, and I don't know what the marks mean at all. OK, well, let's have a look. That's the right way up. We've got on here a Shimazu mon. That's one of the princely families of Japan. And in the area was the Satsuma factory. Are they chrysanthemums on there? -When we turn it up, we'll have a look. We've got "Dai Ni Hon" - "great Japan". Satsuma, they've abbreviated the mark. It's a more complicated character than that. And then "Niyaki", which is "fired" or "kiln". -Dragons in... in Europe are bad news. They come and eat you, we lock the city down. In Japan, or in China as well, they are good news. so this white dragon is over the water. ..because they bring the rains. -Oh, I see. Hence the water. And they often fly about in the sky and bring the rain down. we've got... There's your chrysanthemums. I don't know. I have my doubts. were actually made in Kyoto. I'm trying to prove it, but I'm not getting very far, but we'll see. I have found dated pieces of this so-called Satsuma. I think if they're anything, this is probably about 1870. -What's happened to the Japanese market? Yeah, afraid you're right, afraid you're right. You could buy that today for £800-1,200. When, I can't tell you. -Hang on to it, because you love it. -I would anyway. I love it, yes. Thank you very much. I now know what it is. The size is just ridiculous, isn't it? -Well, he came into my family in 1957.
who was a very close friend of my grandmother's. and her adopted son was just about to throw him on a bonfire. -Erm, originally, he was one of a pair. of this lady's front door. -bear succumbed to the flames, I'm afraid. And what about the owl? Have you found out... Which country would you say? -My guess is Black Forest. It's a native softwood to that area, pine or something like that. that sort of souvenirware, for want of a better word. I mean, this is great quality. You have the hall stands and you have one of this size. ..it's just mind-blowing to think one went on the bonfire. -The restoration hasn't been great. All of that can be, sort of, sorted out. "I want a piece that big because my house is so impressive." You know, it's a shame, it does spoil the value. The damage will spoil the value. I know it sounds awful, but they burned the right one! as to just what this extraordinary contraption is in front of us. this, er, rather unusual fishing rod in 1928.
carp and there's a reference to him having caught these fish in 1915.
which was a flash point of the First World War. Of course, two famous battles. -which, indeed, was fought during 1915.
when he should have been at the front with the other lads? -It enabled him to catch fish for the men to eat. which would have raised morale. shells blew over his head, exploding not far away. I mean, the guts of the man. I mean, this is true British grit and eccentricity, isn't it? I think you've hit the nail on the head with "eccentricity"! But, yes, he was an obsessive and very, very skilful angler. he obviously took fishing even more seriously and came up with this. so this was to give him an advantage in match fishing. 1928, he patented this particular rod. -We have seen photos of him with a similar, but longer, rod. So, somewhere out there, there may be another. -You can have a go, by all means. Now, there's a bit of a screw thread there, presumably for tensioning. -That tensions the rod, absolutely. Gosh, well, immediately, it's just incredibly light. it looks like aluminium, but bamboo, look. I feel kingpin here with this! and obviously steal a match on his competitors. -but his son tells me it wasn't at all successful. was his match fishing exploits with this rod. when he had this rod in his hands. and, again, a Cooper case. it's a £1,500-2,500 case of fish, as long as it stays with the rod. The dace, probably a little bit less. But the rod, goodness me. How do you value something that's never been on the market before? an auction estimate of maybe £3-5,000. Have you ever been to the railway station at Braintree in Essex? Never? And did you know that this was Braintree? I mean, this is just the most extraordinary, brilliant design. in this very simple, green landscape. illustrators and artists from the 20th century. Tell me, where did it come from? on the reverse of the painting. and gave him his first major show in 1934.
and he's really focused on the architecture of the railway station. and, of course, you're looking at a diesel train. apart from the rather humorous driver in the front. so it would be very much a modern statement from Bawden. he would use the station a great deal. So, have you done your own research? Do you know anything about Edward Bawden? where I actually found a picture exactly like this. and that's when I found out it was by Edward Bawden. Of course, you're only really looking at three or four colours. because a print like this should be signed. -so there's a further journey with this picture. Without a signature, it's certainly worth £2-3,000. then it's worth three or four times that. It's worth £6-8,000, possibly even £7-10,000. and then it can be conserved, and then it will be a perfect story. That's nice to know. Thank you very much. Now, I imagine that this is going to tell us something. -Can you tell us who these people are? erm, with his sister, mother and father. That was 1905, because my dad was born early 1905. The belt has come, I think, from her via mum and dad. And this is Harriet in the photograph with the hat on? -where this belt comes from? Where it originated or how she came by it, I have got no idea. You've already tried, no doubt, to buckle this belt up. I'm not a fat man, but this is not going to be anywhere close. you've got a waist of about, I don't know, 18 inches, maybe 20.
wouldn't be outside the door without a corset. No, she must have pulled her corset pretty tight, I think. This has been made in China in about... Hmm, around about 1900. -It's not something that you can wear these days, clearly. -So it's more of a collector's item than a fashion item. -But its Chinese silver, which is always interesting. it's going to cost you about somewhere between £2-250. Good gracious! Good heavens above! where the full-size Austins were made. I think you worked there, didn't you? -But you bought it for your son because of that connection? I bought it for my son to make up for me not having one. I bet you were the envy of all your mates. with the condition it's in now, unfortunately! It had a bit of a rough ride, did it? I think it did, yeah, I think it certainly did, yeah. so it was second hand, this, then, when you got it? -OK. But look under the bonnet. I mean, this is just great, isn't it? which would have powered the Lucas headlights and the little horn. engine might look like with the spark plugs. It's missing its little Austin motif off the top. the pedals and the handbrake. Oh, a nice bit of carpet in there. That's good. which you probably have seen, which is 31923. And that will date it precisely. so there are a lot around, but there's still a huge demand. I would put the value at around £2,000 for a car. Erm... Because it does need a little bit of work to it. I want to know if it still works. OK, Oscar, give it a go. One, two, three, in you get. -Now, Dad, are you going to give it a push? -I'll give it a push. Who are you going to aim for? Cool, kitsch and colourful cats. -I take it you're a cat lover? He's papier mache and he's china. You've spotted the main difference and I'll come to that in a moment. and I suppose I'm going to have to ask you, does it still work? -to make sure it's working! set up a company in Rye in Sussex in 1960 to produce papier mache cats. but, actually, they took up to a day to paint and decorate. -OK, so give me a demonstration, then. That is brilliant. I love the way he gets on and off. These are really quite sought-after, particularly in papier mache. they were quite expensive and they're quite sought-after. There's a good collectors' market for these. -..and probably £250-ish for the papier mache one. you would get £4-500 for that. -You're not going to though, are you? Oh, no! No, no, absolutely not, no! Even my son hasn't played with this! I know what those things are. and, to be absolutely honest, what is it? and bought them home for his son and two daughters. And here they are. Do you know what those things are? You say they're shells. Germans used them. We used a similar thing, a pom-pom. cos that doesn't seem to make any sense. Well, it's entertainment value. He was bored. and you can play a tune on them. You can play a tune on them? -I can play a tune on them. I don't believe a word of this, but go on, play a tune for me. It's a great thing and I love the story. those two projectiles are British 303 ones. trying to put a value on it. For a musical instrument, it's about 30p. it's trench art, it's got a fantastic story to it. but it's brilliant and your musical skills are just phenomenal. ..and it clearly has had a lot of use! -How do you use it at home? I just have it on the coffee table full of cones or goods. I've been looking at it and trying to work out what way up is it? Has it got a top or bottom? I don't know. It's like a child's painting, isn't it? It's awfully childlike, isn't it? made all over the country, all over Britain. Probably, this wasn't made that far away. It could be a Midlands piece. It could have been made in Worcestershire or in Staffordshire. one colour clay onto another. are said to be related to glovers or gloving. Sometimes you get... It's meant to be a little hand or a glove. That seems to be a design you sometimes find on these dishes. That would fit with Worcester. It's a big area for glove-making, isn't it? So maybe it was always used there. But, but you're local. Has this always been in the family? Yes, I inherited it when my grandmother died. She would be about 100 now, if she was still alive, so. but looking at the appearance, we've got to be several hundred years old. 1750 or something like that. but it's still, inherently, a great object. it's still going to be £2,000. but I can also see that this is annotated. There's a name on the front, there. I can't quite read it and it's dated 1906. What does the name say? That's the name of my great-great grandfather, Ioannis Peridis. and what we have inside is a really, absolutely exquisite-looking medal. won this medal at the 1906 Greek Olympics? -He did? That's absolutely amazing. What event did he win this silver medal for? -It was single trap shooting. is that was what was called an Intercalated Games. It was kind of inserted and wasn't strictly official in that sense. doesn't recognise the medals from this Games. -What did you know about him? that he did get to compete, let alone win a silver medal. I have to say, I would be really chuffed to own something like this. these are very, very sought-after and very, very collectable. this could make as much as £3,000. you should be very proud of it. of selling it at all. This is very much, in my mind, priceless to me. So, a tusk with a tail. let alone into your possession? Well, it came in my old Saab, literally! and he used to go and see him until he died. as a thank-you for going to see him. to a great whale called the narwhal? then he became a builder and decorator or whatever. -But now I understand it belongs to you. -So you have a passion for natural history? I've always loved natural history. "I bet you don't know what that is." And I said, "Well, it's in a narwhal tusk", and he was so staggered. That's why she's got it now! So he's left it to me. Well, you lucky thing, because it's a magnificent narwhal tusk. I have ever come across. and they can grow, really, up to about ten feet long. This is nearly ten feet long. ..it acquires this lovely patina and, of course, the tusk spirals. ..and that had come from centuries before. -Looks just like it, doesn't it? so it would need a Cites license. I think at auction you could expect between £15-25,000. So look after your tusk! Two small girls in this photograph. This one on the right is Violette Szabo as a child. and she... In turn, they were lifelong friends. -but a non-combatant can win, the George Cross. she looked after Violette's little daughter, Tania. she would become guardian to Tania. You see, that's just a dreadful thing to have to do, isn't it? -that you're not going to come home. her little girl, to her best friend. One year before she was killed in the concentration camp. ..you would have to say, for the two photographs, £500. -And what a gorgeous-looking lady. So how many years has this lady been lodging with your family? So they would have purchased it back in the what? -and that age is the interwar years. And we're looking at the emancipated woman. She has got that Amazonian look to her. she probably, you know, is driving her own car. She may be even flying a Tiger Moth. And she's built for speed. "Stay young and beautiful if you want to be loved." in an art gallery, as such. at Gleneagles, you might have bought one in the shop there. They were seen as art objects. So, what's the family view on this? or is it something that's just there in the corner? I mean, I've had it for the last 15 years. It does take pride of place, actually, in the sitting room. -It's by a bay window. Well, she is nigh on near as good as the day she was made. I'll tell you just a couple of things that are missing. and it's a bit like a Petrushka-type character. You know, you think they're going to talk to you any minute. Erm... What about the maker? What's the name you've come up with? ..and I thought she might be similar. because I've seen the signature on her. That was, erm, through your monocle? You don't know she's signed at all? because we will see on this plinth, the name F Preiss. -I've never seen that before. ..into the black Belgian slate. on the back of a piece for the foundry mark. a whole range of subject matter. that she's on this lovely stepped plinth. -It's an architectural plinth. It just raises the game. -just look at the enamelling on her. -Despite a lack of make-up? £7,000, would you be pleased? Yes, I would, yes, of course. Yes. So, I know that she's worth £10,000, so would you be delighted? I would be delighted, but I didn't come here with those expectations! Let me ask you, sir, where did they come from? that she picked up at a local auction. All right, when did this take place? Friday night. About eight o'clock. -So, we're talking about a day and a half ago, you bought these. What was special about the box that made your wife buy these? The ribbons, the cotton reels and the price, I think. -So £2 plus the auction house's premium on top. So, in other words, £2.26. -That's not very much, is it? that this was in this box, did they? -They are four little buttons. Each of the buttons is pretty, it's very well matched. You can see it is a set. And the surface of each of the disks is covered with enamel decoration. the back of it is mounted in a rose-coloured metal. This is 14-carat rose gold. just because of the fact that they're, you know, gold. of what looks like a mark? On that mark, I see a stamp of the number 56. -it suggests, to me, that it's Russian. made at the start of the 20th century. -Are you following me along here? ..is the mark of a goldsmith by the name of August Hollming. Don't know if you'd have bought it, but your wife bought it. ..was a set of Faberge gold cufflinks. -..although they are ostensibly four little buttons. -which is a delicious feature of Faberge. One of them is damaged. In other words, yes, they are inconsequential. -but probably no more than £50. But they're not worth £50, are they? They're going to be worth £1,000-1,500, aren't they? -They've been in the family for 40 hours. At £1,500, that's more than 600 times what they paid for them. Now, one last surprise for Roadshow veteran, David Battie. that he wanted to show you and get your expert opinion on. Can you possibly identify the sitter? No, I can't help you with that. I've no idea why you brought me that. Everyone, who do you think this looks like?